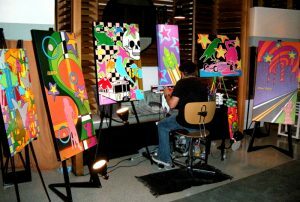 Painting "LIVE" @ the "W" Hotel, AWWWW YEA! It’s always a blast to catch up with my peeps at the Infusion Project, jam out to some great spinnin’ and flowing vibes! It was D.J. SCHUGAR’s B-day this past Saturday night and we all tour it up at the “W” Hotel in San Diego! Thanks to all you peeps that rolled out and hung at the event! Here’s to next time!